For a while now I have noticed a few musicians associating themselves with toy robots. Okay, maybe not many, but enough for me to mention. I finally wanted to compile some sort of page showing the rock and roll connection to toy robots that I have found merely by accident. 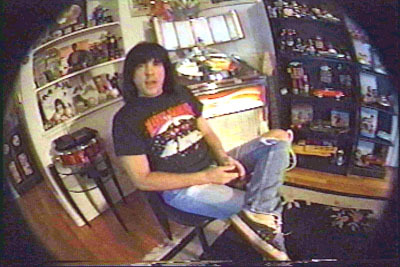 At the left is Marky Ramone from the Ramones, the picture is from the video Ramones We're Outta Here. Check out Marky's awesome robot collection on the shelves! I need to try and talk to Marky about displaying a few shots of his collection here. The Ramones have been a part of my rock and roll youth days, and a great enjoyment to me. I love these guys! I had the opportunity to see them in their "Escape From New York" tour in Phoenix. I still have my shirt! 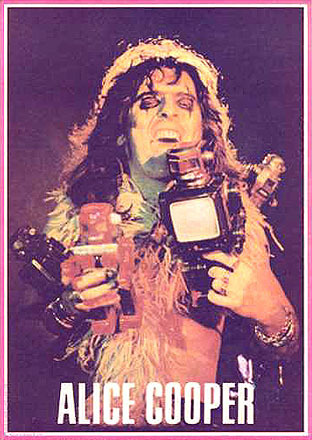 Alice Cooper is on the right with an unusual pose with several toy robots I am in envy of. 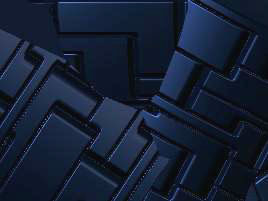 This shot was taken from a shirt graphic. After seeing this, I have wondered if Alice was a robot collector also? I need to attempt to talk to Alice about his 'possible' robot collection. If so, he is free to display a few shots of them here! At the left, we have the group Blondie with lead singer Deborah Harry. 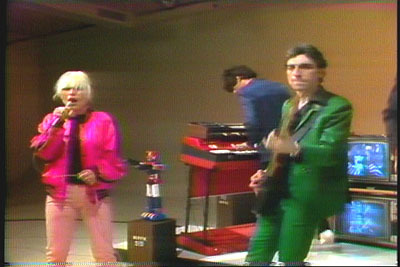 The pictures are from the video 'X Offender' from Blondie Greatest Video Hits. Note there are two Shogun Warrior robots on her set. The third picture down, a shogun is being passed to his right. I stumbled on this by accident as well. I'm so glad I did! I was a Blondie fan in high school, before the birth of MTV. Blondie was a hybrid of punk, pop, and dance music I would say. It was the dawn of video, and groups like Blondie pioneered the video revolution we see today. Although, the videos seem different from today's, remember this was the beginning. 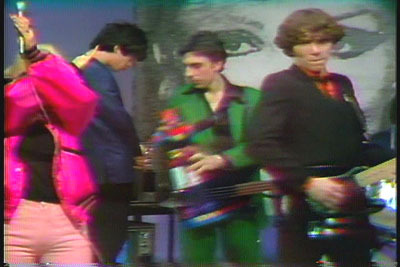 One trademark of early pre-MTV and early MTV videos is the vibrant color. The Shogun Warrior robots shown here help to add fun color to the set!